They speed past gas guzzlers in traffic, ignore congestion charges and get city centre parking for free. In a country whose wealth is fuelled by oil, Oslo has become the world capital of the electric car. "There are more electric cars per capita here than in any other capital of the world," said Rune Haaland, the head of the electric car users association Norstart, standing in a city centre car park forbidden to other car users. 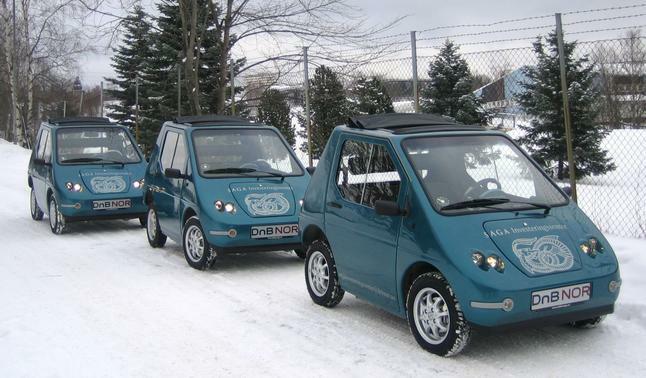 Almost 4,000 of the small, clean and silent vehicles are on the roads of Norway, although they are found mainly in the cities, and the number is climbing as new models come onto the market. From the tiny, locally-made Buddy, to the sporty Tesla, which can accelerate from zero to 100 kilometres (62 miles) in less than four seconds, all sorts of electric cars have taken to the roads of the Norwegian capital. Norway may be one of the world's top fossil fuel exporters, but it has set ambitious climate policy objectives, aiming to reduce its carbon dioxide emissions by 30 percent by 2020. "The electric car is a very important tool for that, knowing that 40 percent of our emissions come from the transport sector and 60 percent of those come from road transport," Transport Minister Magnhild Meltveit Kleppa told AFP. According to some estimates, the country's 3,891 electric cars allow it to save over 6,000 tonnes of carbon dioxide per year. To persuade drivers to switch to electric cars, Norway has introduced a string of incentive measures. New father Christian Blakseth traded his bicycle for an electric car. "It's very advantageous to be able to park for free downtown and to escape traffic jams," the young train conductor said. "And you don't get drowned in day-to-day spending: it's a car that is expensive to buy but cheap to use," he said. Charging an electric car's batteries at home costs about two euros ($2.90). Norwegian petrol prices are among the highest in Europe. With growing demand, carmakers are rushing to put out new models. And consumers are responding with just as much enthusiasm: in the first quarter this year, an electric car, Mitsubishi's i-MiEV, topped small model car sales in Norway, ahead of all time favorites. "We were planning to sell 400 units (cars) in Norway this year, and we are already at 700. We think we will ultimately reach 1,000," the head of Mitsubishi Norway Bernt Jessen said. Norway has decided to put in place a national network of charging stands across the country allowing drivers to "fill up" their cars in about 20 minutes, just long enough to enjoy a roadside cup of coffee, compared to the seven or eight hours normally needed. The mountain cottage, sacrosanct for Norwegians, could soon be only a few kilowatts away.